Cupcakes 'n Daisies: Time for another, Tools Tuesday . 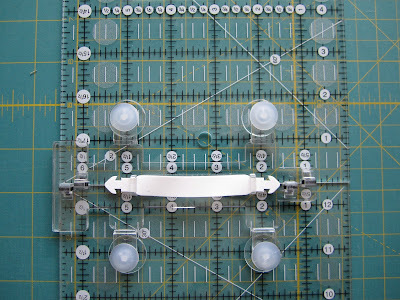 . .
Today's tool is the Quilt Ruler Connector made by Guidelines 4 Quilting. This is another one of those gadgets that I bought at a quilt show after seeing a demo, brought home, threw in my drawer, then forgot about. But after getting it out and playing around with it today, I think it's a gadget I'll use again. The purpose of this tool is to connect your rulers to make them bigger or longer. For my test I connected a 6 1/2" x 18 1/2" ruler to a 6 1/2" x 12 1/2" ruler to make a 6 1/2" by 31" ruler! It's very easy to connect the rulers. First I aligned the alignment tabs and the lip edge on the edge of the first ruler. Once it was snugly in place I pressed down on the suction cups. Then I slid the edge of the second ruler up against the first ruler, making sure it was also against the lip edge, then pressed down on the other two suction cups. Once the connector is connected it is very sturdy and snug. That's all it took to make this looooong ruler. It was also easy to pick up and move around without falling apart. And it stayed together just fine when I cut some fabric. I was careful as I ran my rotary cutter next to the edge where the rulers were connected, but my cutter didn't catch or stop around that area. I remember when I bought this thing thinking this would be a good gadget to take to class or a retreat, where you could take smaller rulers that are easy to pack and turn them into bigger rulers with this connector. It's also great for making super long rulers for trimming the sides of quilts or borders. It runs around $10, I think this is a keeper, it's going back into my tools drawer. Jackie asked if this connecter could make two rulers wider as well as longer, and the answer is yes. Here I have a 4 1/2" x 12 1/2" ruler and a 6 1/2" x 12 1/2". 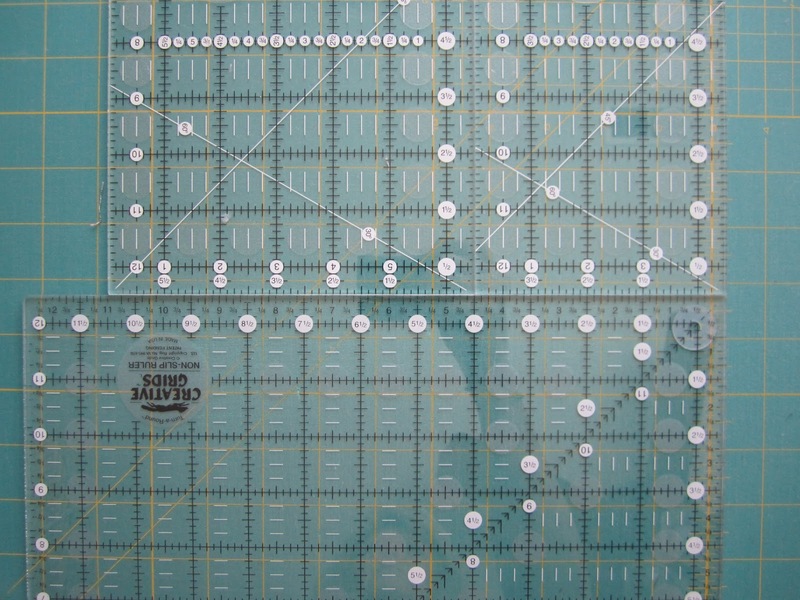 And here they are connected to make a 11" x 12 1/2" ruler. The width is exactly 11 inches, no space was added by using the connector. 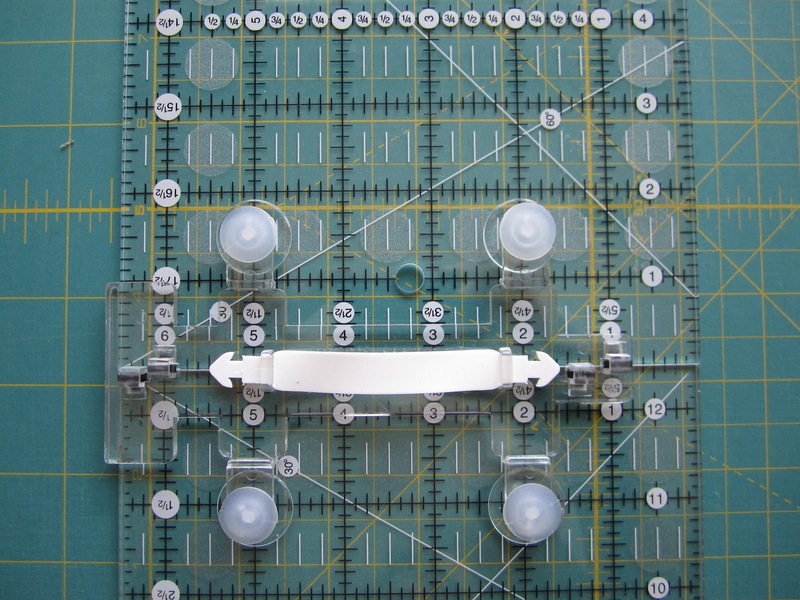 Additionally, you can use more that one connector to make a wider and longer ruler. The link to Guidelines that I provided above shows how to connect the connector and different combinations for using the connector. It's a great resource for this tool. 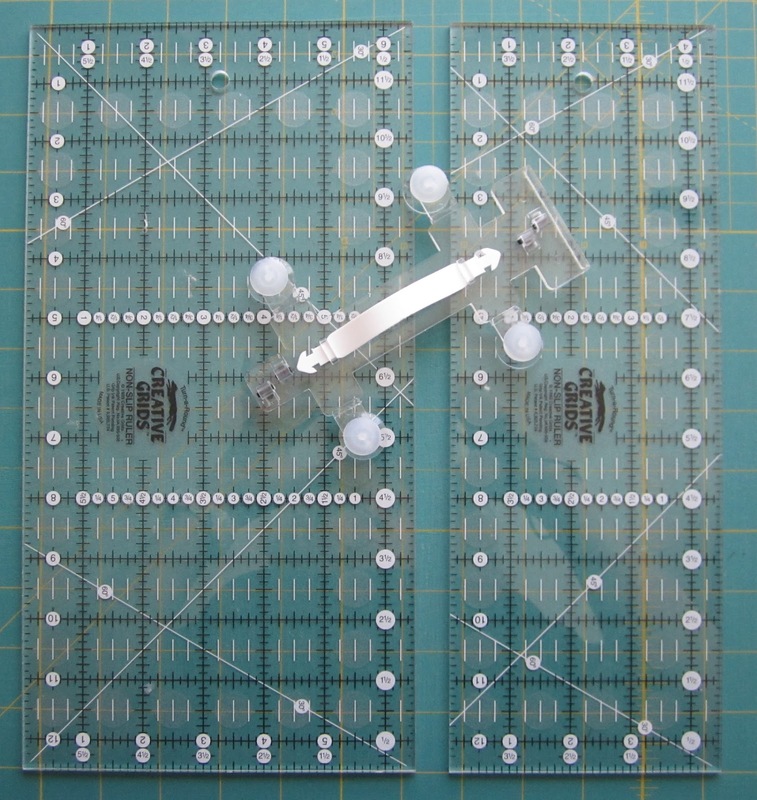 And finally, you can also connect your rulers to make a corner square ruler (thanks Jean(i.e.)). Here's another ruler I own that I'm curious about and thought I would do a little checking on before I spent a half a day trying to figure out how to use it. It's a ruler to make pineapple blocks. I bought it years ago because I've been wanting to make a pineapple quilt for years. The companion book for this ruler has amazing pineapple quilt patterns and was worth the price alone. I bought the ruler and book at a quilt show as a set. Now that I've been sewing for awhile, I've figured out there are several ways to make pineapple quilts, you can paper piece them, sew and trim using a regular ruler, and sew and trim using a specialty ruler, like this one made by Possibilities. This sort of reminds me of piecing a log cabin block, and there are speciality rulers for that, but I've gotten along fine piecing my log cabin blocks without them. Have you made a pineapple quilt, what method did you use? Does anyone have any experience with this ruler? It's sort of hard for me to use and rate this ruler when I've never made a pineapple block using any method! I never thought to make a longer ruler with the connector, I only thought about making a wider ruler so I didn't think it was something that I needed. One of those, I understand now moments! I believe I need that connector thing. I'm always running out of ruler!! I had seen them but I thought they would be too gimicky and not work, but now, well I'm going to need to give it a try. I have that same book and ruler. I took a class with Jane Hall many many years ago because I wanted to make a pineapple quilt. I have some pre-printed paper from that class. Then the Possibilities girls came to one of my guilds for a lecture and I picked up the book and ruler... recently I bought the pattern by Fig Tree... see a pattern going on? Many methods and no attempts at them. Still, one day I'll get around to it! Thelma, would you use that gadget to make the ruler wider? Would you feel like the measurement would be accurate? I don't think I have a long ruler wider than 8.5" and I sometimes need to make a wider cut. I've enjoyed this series! 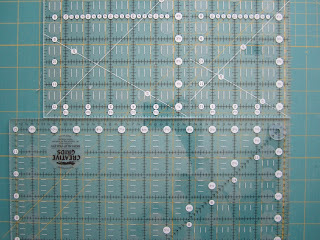 As for the pineapple rule, yes I have used this ruler to make several pineapple quilts. In fact the quilt on my bed right now was made using this method. The ruler works great. I've also paper pieced pineapple blocks and while that works, I think I prefer the ruler. Less mess I guess. I have the pineapple book - will have to look around and see if I have the ruler. Have not made a pineapple quilt, but it is "on the list". what a terrfic idea. I am a gadget addict so will have to keep my eyes open for one of these. I have that pineapple ruler and have used it (but it's been so long I don't remember the details!) - I do not have the book. I make lots of tiny pineapple pendants and of course, they are paper pieced. To me, the method depends on the size of block you want. For tiny, I like paper piecing, but for anything over a few inches, I would rather just piece it and use the ruler! p.s. - has Cooper forgiven you for putting that helmet on his head? I saw Alex Anderson demonstrate the connector once. Looks like a great tool to have on hand. That connection gadget would be awesome when you're trying to square out a larger piece. I bought a pineapple book and ruler and gave them both away because I was so frustrated. I ended up trying to salvage the rest of the quilt because I liked the fabric so much. It sort of worked. I will NEVER make another pineapple quilt. I think if you want to make one seek help from someone who's done it. I have the same book and ruler to make the pineapple quilts as I really like them and have wanted to make one for quite a while. If you try it out and like it let me know as that might light a fire underneath me, nothing like seeing another quilter make something that inspires you, even better, a quilt along pineapple quilt!!! !Good luck! I have used that ruler several times making pineapple blocks. Works great. That book is good, too. I didn't end up using that ruler but I have it! Just about everyone I know has used it and has loved it. I have been wanting to make a pineapple quilt forever... and now that Joanna has published the Pineapple & Figs pattern using a super easy method... that's the one I'm going to make. I must live under a rock (or above the 49th parallel !!) because I haven't seen either of these tools before!! So that is how you use the Quilt Ruler Connector! I have had one for years and never figured out how it worked...it was the lip that had me flumoxed. You see why I am not an engineer. I have used a Pineapple ruler but was not impressed. I really prefer paper piecing for pineapples...small ones. 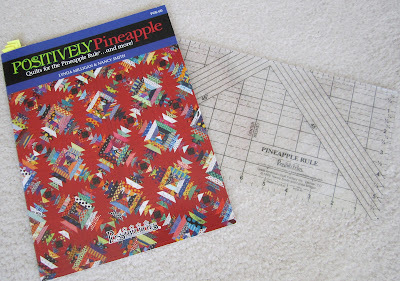 I have the book and the ruler too but haven't made a pineapple quilt yet. I'd like to make one from my Fig Tree stash but haven't figured out the color combo yet. 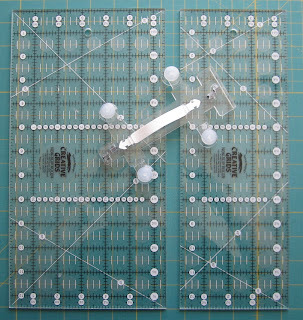 That ruler connector looks like it would be great for cutting borders from the length of fabric, which is what I usually try to do on bigger quilts. I'll hve to look for it this weekend at the PA Quilt Extravaganza show. 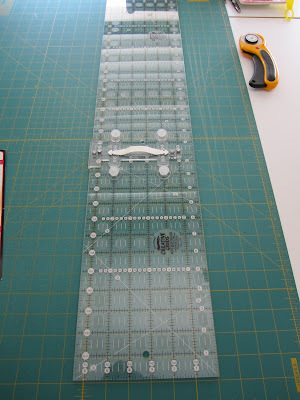 I so need this ruler connector! I am on the search for one now. Cool tool! I have made a pineapple quilt using paper piecing. I really love paper piecing and probably wouldn't do it any other way!